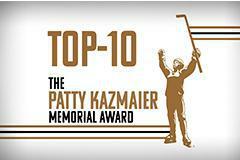 COLORADO SPRINGS, Colo. – Senior forward Loren Gabel (Kitchener, Ont./Clarkson University), senior blueliner Megan Keller (Farmington Hills, Mich./Boston College) and senior forward Annie Pankowski (Laguna Hills, Calif./University of Wisconsin) have been named the top-three finalists for the 2019 Patty Kazmaier Memorial Award, it was announced today by the USA Hockey Foundation. The 2019 Patty Kazmaier Memorial Award will be presented at a brunch ceremony at Cascade Fine Catering in Hamden, Conn., on Saturday, March 23, as part of the NCAA Women's Frozen Four weekend hosted by Quinnipiac University. NCAA’s leading goal scorer with 34 and second to linemate Elizabeth Giguere for most points in Division I with 61 through 32 games … Ranks first in the NCAA in game-winning goals (9) and hat tricks (3) ... Has recorded at least one point in 27 of 32 games, including 17 multiple-point outings … Leads NCAA in goals per game (1.06) … Posts nation’s third best plus/minus (+41) … Clarkson’s all-time leading scorer with 205 points, including school-record 110 goals through 154 career games … Named Women’s Hockey Commissioner’s Association National Player of the Month on two occasions (October, January) ... Named ECAC Hockey Player of the Month on two occasions (October, January) ... Named ECAC Hockey Player of the Week on three occasions (Oct. 22, Nov. 26, Jan. 28) ... Named NCAA First Star of the Week (Jan. 29) ... Named NCAA Second Star of the Week on three occasions (Oct. 23, Nov. 27, Jan. 22) ... Named NCAA Third Star of the Week (Feb. 5) ... Volunteers at Potsdam Elementary School ... Participates in Smart Cookies Enriched Program, Clarkson Women’s Hockey Lil’ Knights Club and Active Souls Project with Special Olympics ... Volunteered with Sick Kids Hospital in Toronto and participates annually in Skate with a Knight, as well as Potsdam Community Outreach Clean-Up ... Has a 2.91 GPA while majoring in Communications. Ranked first in the country among blueliners in points (41), goals (18), assists (23), goals per game (0.55), points per game (1.24) and game-winning goals (5) and is tied for first in power-play goals (6) ... Among all skaters in the country, ranks in the top 15 in points (t-12th), assists (t-15th), power-play points (t-12th), game-winning goals (t-4th) and plus/minus (t-5th) ... Her plus-36 is tied for fifth in the NCAA and is second among defensemen ... She has been on the ice for 55% of BC’s even-strength goals ... She has registered at least one point in 26 of her 33 games played (11 multi-point games) ... Set the Hockey East single-season points and goals record for a defender with 37 points and 16 goals ... Holds the conference career and single-season points, goals and assists records by a defender and is second all-time in career assists with 80 ... Her 16-21-37 scoring line in Hockey East play is good for a tie for second overall while her plus-35 rating leads the conference ... Volunteered with Newton Special Athletes, Perkins School for the Blind, the Boston College Campus School, East Coat Jumbos (American Special Hockey) and Food for Families ... Has a 3.23 GPA while majoring in Communications. She has recorded 37 points (17G, 20A) in 32 games this season and her 1.16 PPG ranks 25th in the NCAA ... Named WCHA Forward of the Week on two occasions (Nov. 26, Dec. 10) ... Named WCHA Forward of the Month (Dec.) ... She had a seven-game goal streak this season, the third-longest goal streak in program history … Currently ranks fifth in plus/minus (+141), sixth in points (193) and goals (85) and seventh in assists (108) in school history … Named a Hockey Humanitarian Award Finalist ... Recipient of the 2016 NCAA Elite 90 Award … Has volunteered more than 2000 hours with Occupaws, where she helps raise guide dogs ... Volunteers at the UW Children’s Hospital … A three-time WCHA Scholar-Athlete, she holds a 3.789 GPA while majoring in Zoology. The selection process commenced earlier this month when NCAA Division I women's ice hockey coaches were asked to nominate players for the award. Players who were nominated by multiple coaches were then placed on an official ballot, which was sent back to the coaches to vote for the top-10 finalists. The independent accounting firm PricewaterhouseCoopers, LLP, tabulated the ballots. 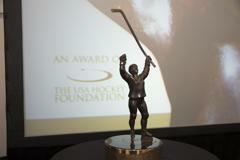 The three finalists, including the recipient of the 2019 Patty Kazmaier Memorial Award, were then chosen by a 13-person selection committee made up of NCAA Division I women's ice hockey coaches, representatives of print and broadcast media, an at-large member and representative of USA Hockey, the national governing body for the sport of ice hockey in the United States. 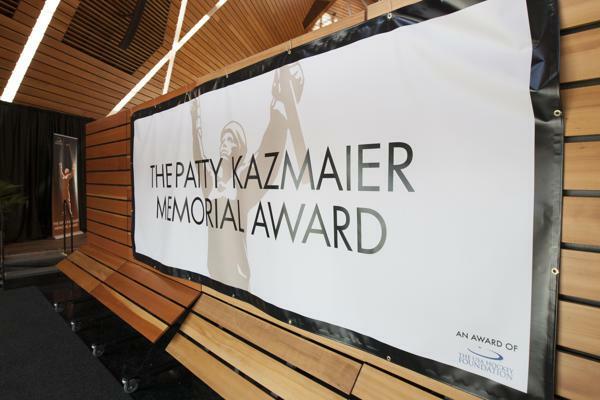 Notes: Tickets to the 2019 Patty Kazmaier Memorial Award Ceremony and Brunch can be purchased at PattyKaz.com. Individual seats to the event are $65, while tables of 10 are available for $600. A select number of sponsorships and program advertisements are also available.